Millennials are taking over the US. Or at least the US economy. 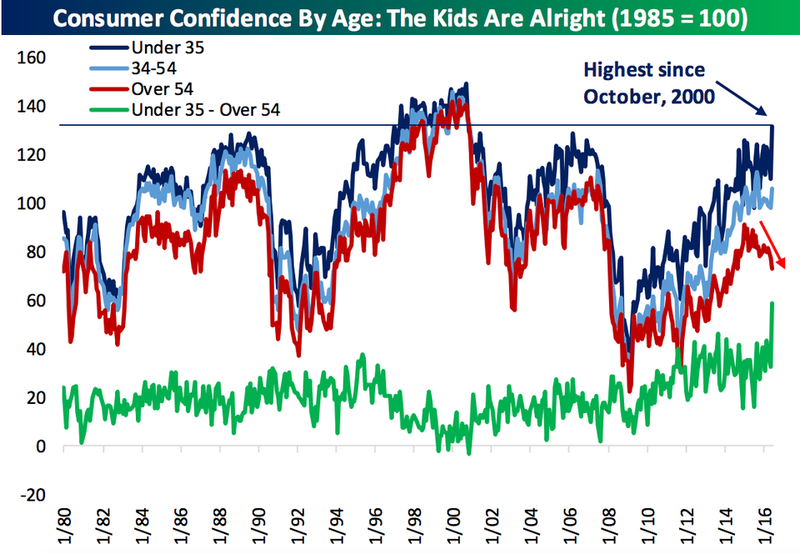 Based on the Conference Board’s consumer confidence index, the folks at Bespoke Investment Group highlighted that the economic confidence of people under the age of 35 is at its highest level since October 2000 and is approaching a historic record. 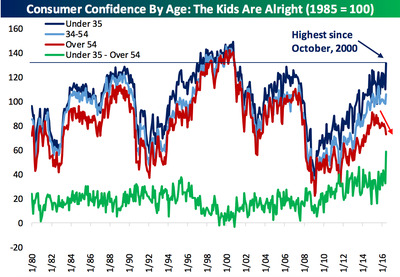 At the same time, confidence for people over the age of 54 has slid in the past year leading to a record divergence between the two cohorts. Bespoke discussed one possible reason for that divergence in a note to clients. “Part of leap in the spread between these two cohorts is random variability, but we also get the sense that the recent record divergence (charted in the green line below) is part of a broader handing off of the baton from the Baby Boomers who are now entering retirement and the Millennials who are only just starting to get married, buy homes, and have children,” said the note. This comes after commentary over the weekend on recently released Census data highlighted that seven of the most common ten years of age in America are all in the 20s. Plus, millennials just overtook baby boomers as the largest generation in America (at least according to Pew’s definitions). On the other end, it is worrying that many boomers have lost faith in the economy. Now, to be fair, the older bracket in the Conference Board survey has almost always been less confident than the young bracket regardless of generational shifts, and we’re just seeing an increase in the spread between age cohorts. One possible reason for the drop may be that the main sources of retirement income, such as yields from bonds, have been dropping in recent years, making the financial future for boomers a tad murkier than for retirees in previous generations. Based on this divergence, it appears that millennials have taken the reins of the US economy from boomers. They spend more, generate more income, and make up the largest swath of the labour market. As they become a larger part of the economy, it is encouraging to see increasing confidence. “While many focus on the demographic weight of ageing Boomers, the US is on the verge of a tremendous demographic dividend as the largest share of the population will be young, highly educated, and ready to consume,” said Bespoke.